Wikborg Rein was founded as a one-man shipping law firm in Oslo in 1923 by Erling Wikborg, later Norway’s foreign minister. The other name partner, Norwegian resistance fighter Alex Rein, joined after the end of the Second World War. The initial focus on shipping expanded to cover energy, banking and other industries as the firm followed its Norwegian clients abroad. It opened an office in London in 1987 and set up outposts in Singapore and Shanghai in the early 2000s. International arbitration has therefore been part of the fabric of the firm from the very beginning, with shipping disputes still a mainstay of the practice in the Bergen office. A successful representation of a European buyer in a then rare arbitration against a Norwegian oil and gas producer around 2006 led the Oslo office to pick up more energy work, later adding defence and telecoms sector clients to the mix. In 2010, the London office recruited three experienced English disputes lawyers from City firms: Robert Jardine-Brown, Chris Grieveson and Clare Calnan (who has since left). Two further partners joined in London in 2016, Mike Stewart from K&L Gates and Nick Shepherd from Ince & Co, both also bringing arbitration experience. The firm reckons it is the only Norwegian firm with a significant English law capability. Other names to know include Trond Eilertsen and Ola Haugen in Oslo and Øystein Meland in Bergen, who have all served as arbitrators. The past few years have seen the practice expand into the upstream gas market, handling disputes between producers in Norway and abroad. It has gained added recognition thanks to its work for Ukraine’s national gas company Naftogaz in a monumental pair of cases against Gazprom, which media reports have valued at around US$80 billion (see ‘Recent events’). Besides Naftogaz, the firm has acted for Germany’s RWE in gas price matters. The London office has advised offshore contractors Kvaerner, Seajacks, Synergy, Bassoe and Prospector; shipowners Spar Shipping, Navig8 and Pareto; and mutual P&I insurance associations including Gard, Norwegian Hull Club, London P&I Association and Britannia and Standard Club. It’s also acted for commodity traders Ronly and Bulk Trading. HNA Group, one of the largest privately owned conglomerates in China, has used it in more than 50 disputes since 2011, with a combined value of US$360 million. In 2014, the London office helped an energy contractor prevail in an expedited LCIA arbitration against an Italian oil company concerning a major offshore project in Kazakhstan. After a nine-day hearing, the client was awarded more than 80% of the US$112 million it had claimed. The Oslo office won a gas price adjustment for a Czech affiliate of RWE against Russia’s Gazprom in 2013, in an ICC arbitration seated in Vienna. The award entailed a refund of more than €1 billion from Gazprom. The year before, the firm persuaded a different ICC panel to reduce the client’s “take or pay” obligations for gas purchased under the same contract. Another success was in 2011 for Norwegian shipping group Odfjell, securing the enforcement of an SCC award worth US$44 million against Russian state-owned shipyard Sevmash in the courts of St. Petersburg. In December 2017, the firm obtained a final award for Naftogaz in a Stockholm arbitration against Russia’s Gazprom under their long-term gas supply agreement. The SCC tribunal upheld Naftogaz’s claim for a downward price revision linked to German hub rates – but applied it only after 2014, three years later than Naftogaz wanted. It threw out a US$56 billion counterclaim by Gazprom for alleged breach of “take or pay” obligations. Naftogaz claimed the total positive financial effect of the award will be more than US$75 billion over the life of the contract. Gazprom has disputed this interpretation and is pursuing set-aside proceedings in the Swedish courts. Just a couple of months after obtaining the final award for Naftogaz in the above mentioned arbitration, the same SCC tribunal handed down a second award concerning a US$16 billion claim Naftogaz brought under a separate gas transit agreement. The tribunal awarded Naftogaz US$4.63 billion in damages, although Gazprom will only have to make a net payment of US$2.56 billion as a result of residual payments owed by Naftogaz. In both of the arbitrations, Wikborg Rein partners Dag Mjaaland and Aadne Haga co-counselled with Swedish firm Gernandt & Danielsson and Ukrainian firm Aequo. Wikborg Rein is also representing Naftogaz in the Swedish set aside proceedings initiated by Gazprom and English enforcement proceedings initiated by Naftogaz. In 2018, the firm secured attachment of Gazprom assets in the UK. Working again with Aequo, Wikborg Rein saw an SCC arbitration in which it was representing Naftogaz’s gas production subsidiary UkrGasVydobuvannya (UGV) reach a partial award. UGV brought the claim against subsidiaries of Misen Energy, a Swedish company that media reports have linked to controversial Ukrainian oligarch Dmitry Firtash. In 2018, the tribunal hearing the dispute over a joint venture agreement issued a partial award largely dismissing UGV’s claims that it was procured through collusion or corruption, but also ruling that it must be terminated, an outcome UGV had been seeking. An award on quantum is yet to be issued. Naftogaz has instructed Wikborg Rein, Aequo and Gernandt & Danielsson in a new phase of its “gas wars” with Gazprom. This SCC arbitration consolidates two new claims Naftogaz and Gazprom filed against each other in 2018. Gazprom is seeking to terminate agreements between the two parties in the wake of the aforementioned Naftogaz gas pricing award, while Naftogaz launched a claim worth more than US$11 billion once again seeking a revision of the tariff it charges for transporting Russian gas. Wikborg Rein reports securing victory defending a Turkish contractor from an ICC claim brought by an Italian subcontractor and arising from a road project in Oman. The firm hired Charlie Pope, a senior legal counsel at Norwegian energy firm DNO ASA and former Curtis Mallet-Prevost Colt & Mosle associate, as counsel in the Olso office. Shawn Kirby, a London-based practitioner who has experience in construction and energy disputes, was made partner. One client who used Wikborg Reinin a dispute related to a long-term energy supply agreement says the firm is “uniquely experienced in this very specialized field” and that Dag Mjaaland and his team “continue to impress” with their dedication, responsiveness and desire to win. Eirik Thomassen, head of legal in the project department at Kværner, has high praise for the firm’s work on a complex dispute that encompassed a vast number of technical and commercial issues. “I think it is their good balance between attention to the details and a holistic approach that distinguishes them from other arbitration teams,” he says. Wikborg Rein was founded as a one-man shipping law firm in Oslo, Norway in 1923, and celebrated its 90th anniversary in 2013 as a 240-lawyer full service firm with offices in Norway (Oslo and Bergen), Japan (Kobe), the UK (London), Singapore and China (Shanghai). Wikborg Rein's practice has been international since the very beginning, as the firm followed Norwegian clients, initially in shipping, and later in energy, banking and other industries, abroad. International arbitration has accordingly always been part of the firm's practice. Matters related to the shipping and offshore oil and gas industry remain a mainstay of Wikborg Rein's international arbitration practice. 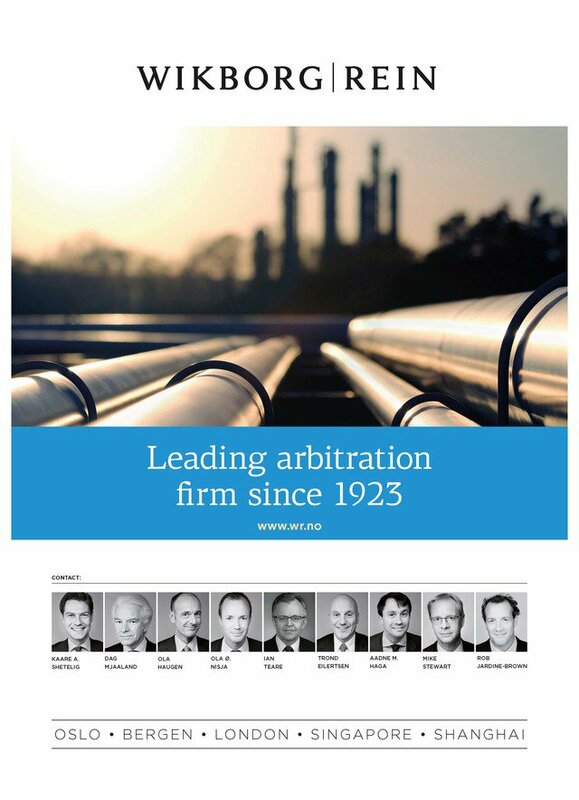 Since the early 2000s, Wikborg Rein's international arbitration practice has expanded significantly driven by disputes within the international energy industry. In recent years, the international arbitration practice in Wikborg Rein's Oslo, Bergen and London offices have seen an increasing case load in the fields of energy, defence and telecommunications. The firm's appointment in 2014 to represent Ukrainian Naftogaz in its Stockholm arbitration disputes with Gazprom confirms the strength of Wikborg Rein in international arbitration.